Texas Submission Hunter returns to the Humble Civic Center for Texas Submission Hunter Blue Belt Edition. The event takes place on May 27 and will feature only blue belts. 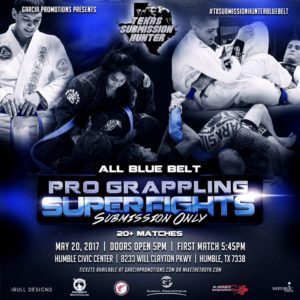 Get all of your Texas Submission Hunter Blue Belt Edition tickets here at MikeTheTruth.com. Check out the card below.